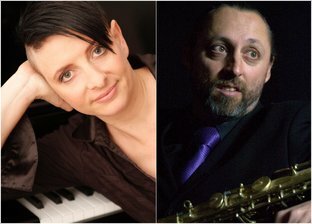 Incorporating the fine talents of Leonie Cohen (piano) and Steve Arié (saxophone and vocals), Two Tone Incorporated play a huge mixture of jazz and Latin standards in a style all their own. Leonie Cohen completed the Jazz Course at Sydney Conservatorium in 1992 and has performed extensively throughout Australia and overseas. She works regularly with Christa Hughes, Tango Saloon and Six Quick Chicks. She has toured around Australia playing piano for David Campbell. Steve Arié has performed with countless Australian greats including D.I.G., Dale Barlow, Bernie McGann, Ten Part Invention, George Washingmachine, Wanderlust, Pardon Me Boys, Errol Buddle, Bob Bertles, Frank Bennett, Martin Plaza and Gyan.